Jeanette Jenkins, who is one of America’s leading fitness professionals and personal trainer to many athletes and celebrities, is the creator of the Hollywood Trainer Weight-Loss Plan. Although Jenkins is known for her intense workout routines she says that her plan is suitable for people of all fitness levels. Throughout the book Jenkins places the emphasis on improving your health and fitness levels, rather than focusing on weight loss as a goal in itself. Before commencing the program you will undertake a comprehensive self-assessment test, which evaluates your current physical and emotional state. The idea is to help you understand where you are at in your health and fitness so that you can follow a plan that is suitable and will allow you to make progress. The program takes a holistic approach that gives an equal amount of attention to nutrition, fitness, and psychological factors. For each day of the program there is a personal affirmation and a daily tip. Jenkins says that too much information at once is not useful because you won’t be able to absorb it all. Instead she likes to present readers with smaller snippets and then if you want to learn more about a specific subject you can read the whole section related to it in the back part of the book. Jenkins provides dieters with a comprehensive nutrition and fitness plan for 21 days, which includes recipes of her own creation. Although the program is relatively stringent it contains a strong inspirational component that will help to keep dieters motivated. Oatmeal, raw dairy, eggs, chicken, turkey, whole wheat bread, pasta, non-fat yogurt, whey protein, cottage cheese, salmon, tuna, spinach, broccoli, lettuce, tomato, apple, banana, walnuts. Turkey sandwich (turkey breast slices, lettuce, tomato, mustard and two pieces of whole wheat bread). The book includes photographic illustrations of exercises and also comes with an exercise DVD. The fitness program involves a combination of cardio and circuit training and all of the exercises are low impact. 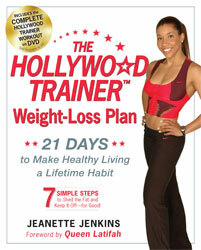 The Hollywood Trainer Weight-Loss Plan: 21 Days to Make Healthy Living a Lifetime Habit retails at $19.95. Convenient and easy to follow. Includes a 21-day meal plan with recipes. Comes with a bonus exercise DVD. Provides information about selecting workout shoes. Explains scientific concepts in a way that is easy to understand. Will not appeal to those who don’t enjoy exercise. Some dieters may have difficulty digesting meals that include such a large amount of water. Jenkins’ program offers a balanced approach to weight loss through addressing nutrition, exercise and psychological factors. Her proven success in the competitive Hollywood arena can give dieters assurance that following her recommendations should produce positive results.